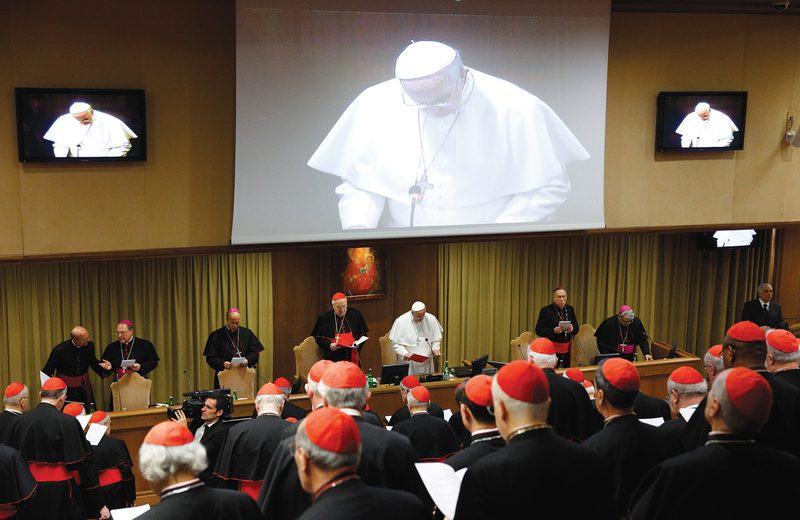 The establishment of two new congregations—the first for Laity-Family Life, the second for Charity-Justice-Peace, which includes a new office for ecology—were among the proposals for reform of the Roman Curia that were presented to the College of Cardinals on Feb. 12 at the opening session of a two-day meeting in the Vatican. There is as yet no definitive reform plan, and the current proposals are subject to modification. Pope Francis convened this extraordinary consistory, as the meeting is called, to brief the cardinals on the ongoing work to reform the Roman Curia and to get their feedback. Some 165 of the 207 members of the college were present when he opened the meeting, among them 19 of the 20 cardinal-designates who were to receive the red hat from the pope at a special ceremony in St. Peter’s Basilica on Feb 14. The pope told the cardinals that “it is not easy to reach such a goal; it requires time, determination and above all everyone’s cooperation.” It means “we must first entrust ourselves to the Holy Spirit, the true guide of the church, imploring the gift of authentic discernment in prayer.” He called for their collaboration and, as at last October’s synod, he urged them to speak boldly, with courage and openness. Cardinals from all continents expressed appreciation for the reforms already achieved or underway in the Roman Curia under Pope Francis, particularly on Vatican finances. There is a clear feeling among the cardinals that the first Latin American pope is getting the work done, and he has the support of the overwhelming majority of them. In a report to the consistory on Feb. 12, Bishop Marcello Semeraro of Italy, secretary for the group of cardinal advisors to Pope Francis, recalled that the function of the Curia is “to assist the pope in his daily governance of the church” and be “an instrument of unity of the church itself,” while respecting the autonomy of the diocesan bishops and the local churches. He highlighted the need for “a rationalization” and “simplification” of the various curial offices and the need for proper and ongoing “formation” of all who work in the Roman Curia, both in terms of spirituality and competence. There is general recognition among the cardinals that reform can be done in stages, that it is not necessary to wait for the definitive plan before implementing changes, Father Lombardi said. This means, for example, that the two new congregations being proposed—Laity-Family Life and Charity-Justice-Peace, with an office for ecology—could be established in the not too distant future. That office will obviously take on a whole new importance when Pope Francis publishes his encyclical on ecology in June or July. This article also appeared in print, under the headline "At Consistory, Cardinals Sense Francis Is Getting ‘the Work’ Done," in the March 2, 2015 issue.